Happy to have placed first in Women 30-39! This weekend, I completed my fastest official 5K race to date, with a finishing time of 24:53 and a mile pace of 8:01. I’m going to take a moment to digress, for the sake of transparency. Even though I’m pleased with my time (more on that in a moment), I didn’t hit both goals I was aiming for. I had two goals. One was to run a 24:00 (or faster) 5K, which means sub-8:00 miles. For me, breaking the 8:00 floor would have constituted a significant positive shift in my speed training and overall fitness. I was pretty close with 8:01, but now I know where I’m aiming next year! However, I did achieve my second goal, which was to beat my previous year’s time. Last spring, I completed my fastest 5K ever at 25:50. This year, I finished almost an entire minute faster. It’s part of my “Faster Every Year” personal campaign in my own fitness. You see, when I run races, something that I am consistently struck by is that there’s always a handful of teen and 20-something track stars who finish before me, but – by and large – the people who finish before me are 40+ (often, emphasis on the “plus”!). 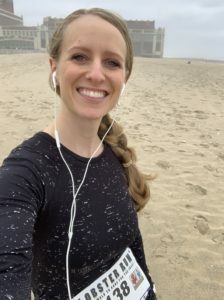 In Asbury Park on Saturday, for example, I found myself toward the end of the race trying to keep up with an elderly gentleman who I had chosen as my informal “pacer”… and I couldn’t. I was tired and I needed to glue myself to someone for perspective and push, but I simply couldn’t keep up with this guy. And to be clear, I’m not an Olympic runner, but compared to most recreational runners, I’m basically sprinting. Yet his white hair seemed to taunt me as he pulled away to the finish line. So… maybe he wasn’t so elderly, after all! Even in the Women’s Top 10, I came in 7th, but three of the women who finished before me were in their late 40’s. One of them ran 7:25 miles (#goals). Maybe I feel a little runner’s jealousy, but the reality is that I love it. Could there be anything more encouraging than being beaten by people who are 15-30 years older than you? I mean… that prognosis looks really good for me over time! I’m inspired by it. I think this is especially meaningful for someone like me, who didn’t believe from a young age that athleticism was possible for me at any age. Sedentary, out of shape, overweight, and insecure, 20-year-old me (who couldn’t run for more than a few minutes) would have been in utter disbelief that 30-year-old me could win first place in my age group in a real race! As we start the discussion of aging, it’s important first to point out that aging is relative. How someone can perceive age (and the aging experience) could be dependent on background, culture, career, family, generation, and other socioeconomic factors. For example, it would be hard to call what I’m experiencing “aging.” Most people would argue that I’m very young, and I certainly am. However, I was raised in the Deep South and moved to the Northeast as a young adult. In many ways, I’m “older” in Louisiana than I am in New Jersey. So let’s start by agreeing that many aspects of aging are relative. Your perspective plays a huge role in how “old” you really are. From a biological perspective, however, there are certain transitions that do clearly mark a change in generation. Menopause, for example, is a physical game changer. These are times where the tectonic plates of what is familiar, reliable, and consistent dramatically shift. However, this is where language – how we think about, talk about, and describe our experiences – can have a tremendous impact. In other words, when we describe what’s happening with our bodies, we’re not just bystanders of the experience. Instead, the words we choose influence our experience – sometimes dramatically! Ageism – negative stereotyping of “older people” (whatever age that actually means to someone) has a tremendous impact on how people perform as they age. Negative impressions and messaging cause people to perform more poorly and enjoy less quality of life as they grow older. 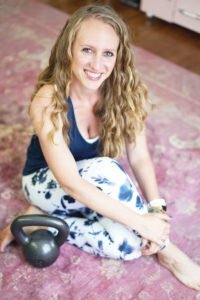 And this can happen way before people are claiming senior discounts – how we think and talk about aging can influence our approach to fitness and health early in life, as well. This interesting study run by the Yale School of Public Health found that subliminal messaging of positive aging stereotypes (i.e. words like “spry”) caused their octogenarian participants to demonstrate physical improvements, like better balance. In other words, the mere exposure to words like “spry” and “creative” – just subliminal suggestions – improved their physical performance. This should be sobering. Studies like these demonstrate how much agency we have in our experience of life. Shouldn’t we be concerned that the inverse is also true – that if we tell people that they have to stop lifting weights or running by a certain age that it may actually make them feel more feeble or incapable or fearful? How often do we limit our own potential through the words, people, messages, and ideas that we surround ourselves with? How are we responding to influence? How many things do we perceive to be “inevitable,” like quitting sports… aren’t? Clearly Joan Benoit Samuelson (61) didn’t heed the common advice to quit long-distance running and take it easier on the joints after 50, as she crossed the Boston Marathon finish line today with a 3:04 time. To put that in practical terms, that would mean that if I had also run the same marathon at my 5K pace (#impossible), you would have had time to go have a nice lunch between her finishing time and mine. The crazy thing about ageism, though, is that the logic is completely upside-down. Negative stereotypes about aging (at any age) essentially argue that we need to quit doing certain exercises because we’re getting weaker as we age. But does that even make sense? Articles like this, for example, get liberally shared on social media. But muscle loss isn’t a reason to avoid lifting weights – it’s the reason we should lift weights and stay active as we get older! There’s no better time to get stronger and fitter than now, regardless of your chronological age! Instead of fearing injury, use your own physical fitness, agility, and health as the reference point. Everyone is different – at any age. I have had coaching clients in their 60’s leg pressing more than a hundred pounds, while I’ve had clients in their 20’s struggle to balance on one leg. So what are the real, physical changes that happen as we age? What are the true “inevitables”? Active people slow down a little – but not as much as you’d think. For example, for most runners, speed begins to decrease by about 0.2% every year after 40, because of biological changes like decreased cardiovascular efficiency. But to put that in perspective, that’s probably just a few seconds for every mile. Muscle mass tends to decrease after the age of 30 or 35. But again, this is extremely relative, and you can use strength training to re-gain muscle that you’ve lost. Your joints can get crankier as you get older, as the cushioning between your joints age. However, many of these aches and pains can be ameliorated with lifestyle factors, like maintaining a healthy weight and building strength in the muscles supporting your joints. But it’s important to keep in mind that even these facts are relative. It all depends on who you are and how active you’ve been throughout your life. If you’re an athlete, you may see that gradual slowdown. But if you’re not currently active, it’s far more likely that you can improve your fitness and see the numbers move in the other direction! By making lifestyle changes to move more, sit less, drink more water, eat better, improve your cardiovascular fitness, and get strong, you transform the aging experience so that you take charge of your biological age, instead of falling victim to beliefs about your chronological age. If you’re an older adult (however you define that!) and you’re nervous about how to incorporate more exercise while avoiding injury, let me be the first to reassure you: you don’t have to internalize the negative messages that clickbait-y blog posts throw at you. But advice that I would give to someone at any age is to start where you are. Assess your own personal physical fitness, and don’t compare yourself to other people or your younger self. Many people slow down dramatically as they age past their 30’s, but this is often less a function of biology than of lifestyle demands. As people grow older, their life often requires less movement of them. Maybe they’re not chasing after children anymore, or maybe their work matures into a more physically passive role. This can result in excess weight, but also stiffness and slowness and “feeling old” (as some of my clients say!). And stiffness often gets worse the less you move, and this can become a vicious cycle. Combat this by using a pedometer to track your step count. Start with your daily average (let’s say it’s 4,000 per day), and each week, try to increase your daily average by 1,000 until you reach 10,000+ every day. Make sure to wear the right shoes and try to spend some of this time outside, getting sunlight and fresh air. Strength training isn’t a “young man’s game.” It’s going to help you be fitter, stronger, more balanced, and more confident. So push yourself. Get a personal trainer, take a YouTube course, or start with exercises you know, and push yourself to get out of breath and feel your muscles burn. This has benefits ranging from easier weight management to stronger grip strength to more confident balance. As you get older, it’s not that you can’t handle this intensity or that you’re going to hurt yourself – but your recovery time does need to be longer between intense workouts. In other words, if you do an hour of strength training on a Monday, take Tuesday and maybe even Wednesday to take long walks, bike rides, or swimming sessions before hitting the weights hard again on Wednesday or Thursday. This will keep you from feeling like you’re burning out and always tired. The same advice could be applied to any age when it comes to beginning strength training – for the first week or two, under-shoot the total weight that you use for exercises, to make sure that you’re not excessively sore afterwards. Then, you’ll have a good baseline from which to improve while still feeling great. Again, this is advice that I would give to someone of any age. It’s important that you not over-focus on things that you can’t completely control, like your total longevity or whether or not you’ll get cancer, and invest your energy in what you can influence, like your quality of life. 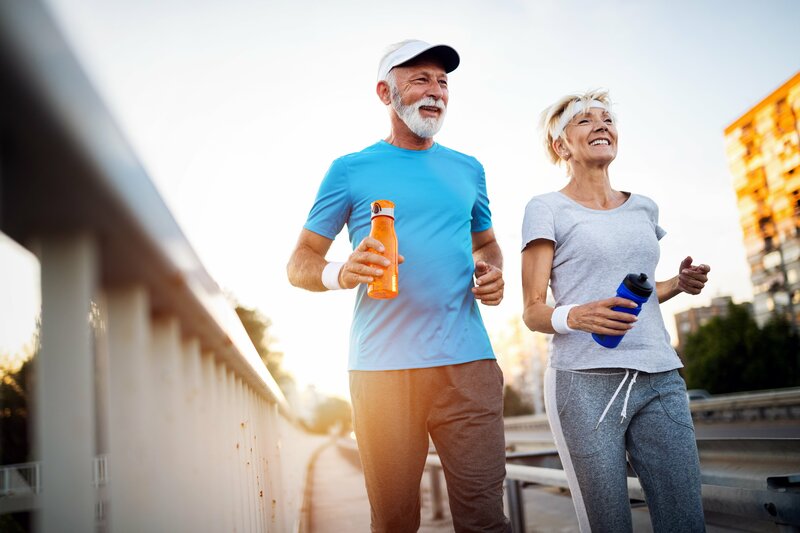 It’s incredibly important, as medical technology continues to improve, that we redefine what aging can be, so that we can enjoy lives that are not only long, but as active and rewarding and independent as they can possibly be. I have seen clients who “felt old” completely revolutionize their experience of day-to-day life by getting stronger, fitter, and leaner. I know it’s possible not only because they’ve done it, but because I’ve done it for myself, too. After all, if I had continued on my trajectory of what I thought it meant to be 30 when I was 20, I would not have placed seventh in the women this weekend. I wouldn’t have run the race at all. I wouldn’t have believed that I could. I certainly would not have believed that – maybe next year – I’ll catch up with that guy! You, too, can be faster every year. And the best time to start is now.